The Biggest Heists in History #Infographic ~ Visualistan '+g+"
Despite probably taking place before you were born, it’s likely you’ll have heard of the Great Train Robbery – after all it’s one of those crimes that have gone down in history. It’s even had numerous films made about it. However, do you know exactly what was stolen and how? It’s no surprise that big robberies become so legendary, seeing as it’s often something we think we’d only see on the big screen - whether because of what was taken, how it was taken or how the thieves were caught. 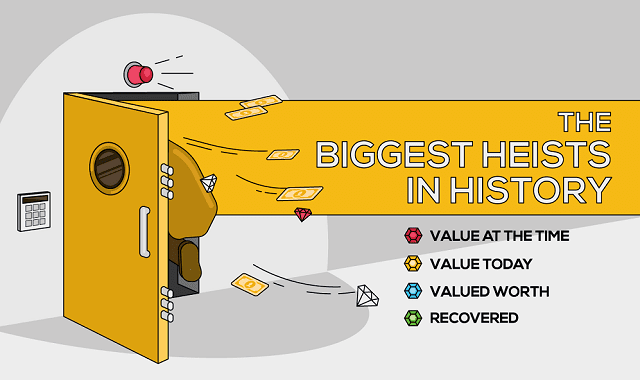 With this in mind, Bullion Vault’s latest infographic explores the biggest cash, gold, jewellery and art robberies the world has ever seen, including the Lufthansa heist, the Hatton Garden raid and the Isabella Stewart Gardner Museum theft. How many of these have you heard of? The infographic also looks at how the heists were carried out, how much was taken and if any of the loot was recovered. The piece also delves into how some of the stolen goods were eventually recovered, showing that even the most perfectly executed robberies can be foiled by one small mistake. Take a look at the infographic below and uncover a host of treasures that have been taken by criminal masterminds.